It’s going to be a busy year for Rival Sons – then again, what year isn’t? The Los Angeles-based rockers like to stay busy, both in the studio and on the road. They’ve hinted at a new album (their latest release was a tour edition of 2014’s Great Western Valkyrie, out last October), but the biggest news for 2016 is their opening slot on The End, Black Sabbath’s final world tour. Two weeks into the tour, singer Jay Buchanan called Blues Rock Review from the road to describe what it’s like to open for rock giants on a global scale. Rival Sons is now two weeks into The End, with dates confirmed through September of this year. How’s the tour going so far? The days that we play with Black Sabbath have been pretty mind-blowing. Playing to 20,000 people or more…even though you know they’re there for Black Sabbath, just having the opportunity, being on that stage and showing people who we are – it’s definitely mind-blowing. The tour announcement was made last September. How did it all come about? It came about with Sharon [Osbourne] contacting our management after she and Ozzy saw us play at the Classic Rock Awards [in 2014]. We played a couple songs and right after the show they mentioned the tour to us that night. Within a couple of days we were booked to go down to Sao Paulo, Brazil and play Monsters of Rock with Ozzy, and shortly after that we were asked to join their tour. What’s a day on this tour like? Pretty much the same as most touring days. You sleep in because you’re up late. So you sleep in, you get up and get your exercise and everything – I like to go running – and have lunch, and then get ready for sound check. Then for us, we generally play very early, right around 7:40 p.m. That’s been our start time opening for [Black Sabbath], whereas, generally when we’re headlining a show we won’t start until 9, 9:30 p.m. or so, which is what we’re used to. But then we get up there, we play for 40 minutes and we give it all we got. Then we get off the stage, watch a little bit of Sabbath, get on the bus and get to the next city. It’s widely believed that modern rock bands have an easier time gaining traction with audiences in Europe than in the United States. Do you think touring with legendary rock acts like Black Sabbath or Deep Purple will help expose Rival Sons to new fans in the U.S.? I think this has become a catchphrase for people that I think, personally, isn’t very realistic. They say, “You’re so big in Europe and the UK and everything, and you just can’t get a break in the U.S.” We actually have an amazing amount of fans in the U.S. and we get played on radio. It’s just that the United States is so huge. It’s so huge, whereas if we go over [to Europe] and we tour, say for six weeks, we’re going to play in 12 different countries. But just playing in the United States you could tour for 12 weeks and you’re going to end up going through the Midwest, or Texas…the places are so separate. The market is so divided that way, in terms of terrestrial radio. We’ve been able to do pretty well, most importantly on the east and west coasts, and in Chicago we do very well. The band is making a good name for itself. But it’s all of those connecting the dots places where we’ll go, and sometimes we’ll just end up playing to 500 or 800 people. Will this opening slot with Black Sabbath change that? I believe, personally, tremendously. I think it’ll change it tremendously because we’re making genuine rock ‘n’ roll music, and I believe in the quality of it. We have the opportunity to get in front of these people. As much as we like making records, I do believe that Rival Sons is a live band – definitely a live band. 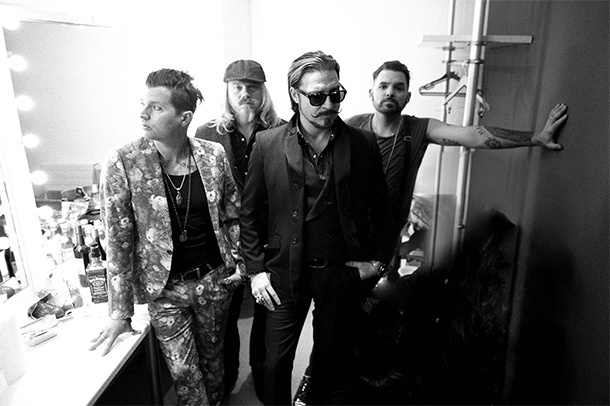 Rival Sons is known for bringing tons of energy to live performances. Looking ahead to a full year of touring, how do you maintain that energy and enthusiasm? For me personally, I love to exercise a lot: run a couple miles a day, get in the cardio, and then stretching – I’m a typical West Coast yoga nut. But I do these things so that I can get through the show without getting too worn out. The thing with touring, all of the hard work: your largest obstacle is boredom. You have to keep yourself occupied. There’s a lot of sitting around and there’s a lot of sitting in transit. I’m talking to you right now and I’m on a bus. So it’s keeping yourself occupied and keeping yourself entertained, reading, just staying interested. As far as the music goes, I think that we’ve always been a band that, it doesn’t matter if we’re playing for a couple of people or if we’re playing to 50,000 people. We essentially give the same show, and the show is us playing for each other. It’s us getting that energy and playing hot potato with that energy. We do that no matter what, and I don’t think anyone in the band has ever phoned it in or just tried to get through it. The music takes care of you that way. The music pulls it out of you; it doesn’t matter how tired you are, or if you have a fever or anything. The music’s going to pull whatever you’re capable of; it’s going to pull it out of you. Last fall, the band released a tour edition of Great Western Valkyrie. What’s changed for Rival Sons since the original album was released in 2014? That was less than two years ago, but two years is a long time for a band. We have definitely changed. We are definitely a different band; a lot of things have changed. A lot of shows, so many miles…just all of the clichés you think of. When we go in to make records there are key ingredients that stay the same. We’re writing songs and we’re trying to record things as quickly as possible, to try to capture and harness that energy. But the thing that changes each time we go in to make a record is us. We’re always different as people. We’re changed people, we’re a changed band. What has changed in the last year and a half? It’s been great because these songs have been able to take on a new life of their own by playing them out live. Great Western Valkyrie was able to keep some traction, it was able to stay afloat, and we were placed in this unique position of, suddenly we’ve got to go out with Deep Purple. This was in late fall [of 2015]; that’s when we’re supposed to be going in and making a record. So we put things together and we said, “You know what, let’s add a bonus track and let’s add a B-side, put a package together and offer that to people.” So we did that, and eventually, in late May or early June, we’ll have another record coming out. We just try to maintain that clip because we have such an incredible opportunity to be in this posse with these giants. What can you tell our readers about the new album? Just that it’s coming out later this year. Don’t really feel like talking about it. We can have another interview when it’s time for that. Are you playing any new material on this tour? We don’t have any plans of playing any new material until the album comes out. We’re fortunate enough to already have five records out, because we like to record as often as possible. The set ends up being the greatest hits of those five records – the songs that really work the best live and translate. We’re playing to these arenas full of people who don’t know who we are. This is their first experience with the band. We don’t feel any need to, like, “Oh, we’ve got to give them something new.” They don’t even care who we are. We’re an afterthought to them. So we want to give them the best show we’re capable of in 40 minutes. Which cities or venues in particular are you looking forward to playing? Yes. The L.A. Forum, definitely happy about that. And Madison Square Garden. I mean, Madison Square Garden. That is a big deal. We’re playing a lot of sports arenas and things like that; they’re all special places and they’re all huge, but Madison Square Garden is of a different ilk. I’m very excited about it. That’s a bucket list. What’s your personal perspective about this chance to open for Black Sabbath? I’m elated. Unfortunately, a couple of dates have been cancelled. I’ve heard nothing but positive things coming from our management, concerning Sabbath, and that the tour’s going to go on. I’m over the moon about this opportunity, especially with this being their last tour. It really is such an incredible thing. You get used to just about anything pretty quickly, the way we adapt to situations. But this is a really good deal, this is a really big deal for a rock ‘n’ roll band, to be able to open for Sabbath, and we know it. We’re not taking it for granted; we’re just trying to give the best show we’re capable of and show people that new rock ‘n’ roll is here. We were lucky to catch Rival Sons at the O2 in December, we went to see Deep purple, and are glad we caught all of the Sons set. Hadn’t really heard any of their stuff, other than a local band who cover Pressure And Time, but it’s all you hear in our house/car now. Hopefully be able to catch them again sometime soon, but will have to wait until they are in the UK again. Mate, you HAVE to listen to Great Western Valkyrie, its the best rock out there. Period. Immense album. Enjoy. I am a huge fan of Rival Sons. Since my son introduced me to them as we were driving to London Hyde Park to see Black Sabbath in 2014. I’ve been to 7 of their gigs since then. One was at the O2 with Deep Purple and I went more for them and also went to Ramblin Man Fair again mainly to see them. So I must disagree with Jay when he says that people at the gigs with Sabbath don’t care or know who they are. I’m also going to Download just because they’re there. Sons fans are loyal and will travel however far they have to to see them. Saw RIVAL SONS show the day this interview was given, at The Regency in SF. They headlined and Jay had a fever, he mentioned it more than a few times that evening, but the thing is… you couldn’t tell. He’s right about none of ’em phoning it in, and the show at The Regency was no exception. I have seen them before at The Fillmore and they just keep getting better and better. I think it is entirely fitting that Sabbath has graciously added them to The End tour because they will be the ones who carry the torch when its all over. RIVAL SONS are the best thing going as far as this generations Classic Rock bands go, if anyone doubts this, check em out and see for yourself. It is a great time to be alive. I want so much to hear Jay Buchanan live that I buy ticket to Copenhagenhell. Never hear Metal music. Jay is the most wonderful I have heard for many years. They DO NOT disappoint and with the right (mainstream) backing could/should in years to come be on a par with the stones/led.zep et al. Man, I was at this concert in the Monsters of Rock festival in Sao Paulo and I have to admit, people here in Brazil didn’t know them, I was like “Oh well, whatever, I wanna see Motorhead and Judas and Ozzy soon, don’t care for these other bands.” But as soon as they started playin’ the whole crowd just stopped everything they were doing. We just couldn’t believe what was in front of us!! We just stood there and watched and we couldn’t believe is was real… I mean, you can’t just watch them playin’ ‘Where I’ve Been’ at sunset without feelin’ something… When I got home later that night I just kept listening over and over again and this month I had the honor of watching them for the second time at The End Tour, and I sincerely hope I’ll live to see them headlinin’ a show with the crowd screamin’ their names ’cause they surely deserve way more!